Mabel is an authentic vintage teenage holiday diary from August 1930, illustrated with selected period photographs. 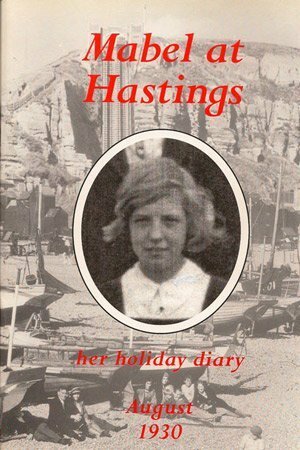 Rich in historical observations, it is a detailed account of Mabel and her best friend Dorrie’s summer holiday visit to Mabel’s aunt at the seaside, from their homes in Kew near London. Mabel celebrated her 14th birthday during their stay. It is a charming cameo, wonderfully evoking the atmosphere of the era between the First and Second World Wars: how the girls amused themselves, what they wore, and what they ate. The diary makes fascinating reading, enabling teenagers and adults to compare teenage holidays today with those of the 1930s. It is a glimpse into teenage life without smartphones, computer games, Facebook, Twitter and television. Within five years of the holiday Dorrie would die in tragic cicumstances, and Mabel would be married, with the first of six children on the way. Mabel’s son, Robin Squire assembled and printedthe book from Mabel’s original handwritten holiday diary. Hastings Library were kind enough to supply a selection of contemporary photographs of the town. Mabel’s appreciative family presented the book to her on her 79th birthday in August 1995, shortly before she died. Mabel at Hastings is a glimpse of social history, of interest to teenagers today, and all those with an interest in the 1930s. Hi Colin, Looking forward to receive your order.